IF YOU'RE READY TO ROCK, LET'S ROLL! Welcome to the homepage of the New York School of Rock (NYSoR). Officially founded in 2007, by longtime professional musician and educator, Chris Milillo, NYSoR offers a wide range of music education programs to students of all ages and levels. We currently have 2 studio locations serving Putnam, Northern Westchester, and Dutchess Counties in New York. Our Brewster, NY studio is also convenient to Fairfield County in Connecticut. Band Workshops offer students the opportunity to rehearse and perform on professional equipment, with a real band of their own! Band Coaching - Work with an experienced professional musician and take your band to the next level! 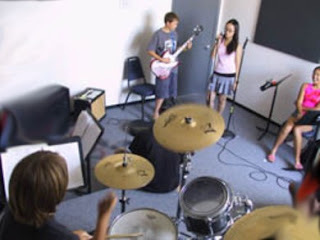 Rhythm Studies for Non-Drummers - Study rhythm with a drum instructor, and gain a complete understanding of rhythm, time and phrasing.